Can I refer a friend or colleague to use Peergrade? 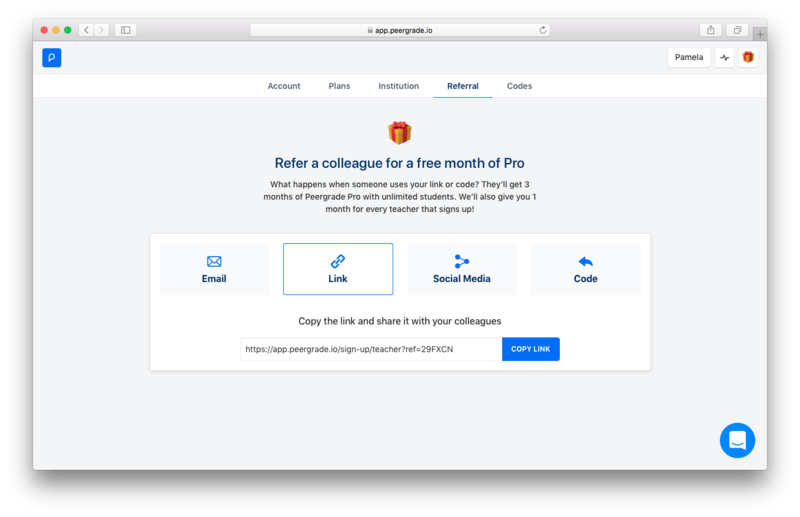 If you want to tell a friend or colleague about Peergrade you can use our referral program and receive additional time on our Trial plan that includes all features with a unlimited number of students. The ultimate Peergrade experience 💪. If you wish to refer someone go to User settings by clicking your name in the top right corner and then click on the Referral tab. You will be presented with various options of sharing a link or code. When a friend or colleague signs up with your link or redeems a code you will both receive additional time on our Trial plan.